Calluses... they're great when they protect the soft, baby skin underneath them but they are the WORST when they rip, leaving you blistered, bloody and raw. This problem is universal in active, fitness oriented lifestyles. Whether you lift weights, CrossFit, climb, mountain bike or just about anything where your hands are vital, callus buildup can be a huge problem. 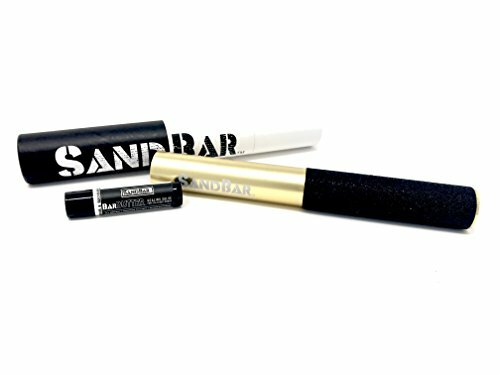 Enter SandBar, the ultimate solution for callus management. Our patent- pending SandBar works away that hard, built- up skin allowing you to train longer, stronger. Each kit comes with our Bar Butter, a natural salve made to condition and nourish your hands. Why risk having to stay off your hands for a week, when SandBar is the non- abrasive solution to keep your calluses to a minimum and keep you and your training on point! We've got your hands, and your back. EFFECTIVE DESIGN: Ditch the scraper, cream, and mask peel for the easiest callus exfoliator for hand and feet care. The round sander is easy to grip and leverage against thick skin layers. PORTABLE AND VERSATILE: Use this bar in the shower or at the gym. Get ready for your Crossfit WOD, Rope Climbing, Gymnastics, Rowing, Rock Climbing, Calisthenics, BodyBuilding, heavy manual labor, and more. HEALING SALVE: Barbutter is better than lotion. Apply this essential oil balm after a callus scrub to moisturize for an amazing pain-free workout. Made with Meringue, it accelerates the healing of men and women's open wounds. SOFTEN AND STRENGTHEN: More accurate than a pumice stone or exfoliating rasp, SandBar is often used for home pedicure, elbow and toe relief while dry or wet. Exfoliate and remove dead skin to feel and grip more. DON'T SUFFER RIPPED AND TORN HANDS: Healthy and clean filing improves athletic performance and hygiene by avoiding callous crack. If you have any questions about this product by SandBar, contact us by completing and submitting the form below. If you are looking for a specif part number, please include it with your message.